"All the news that really hits home: Week 1. 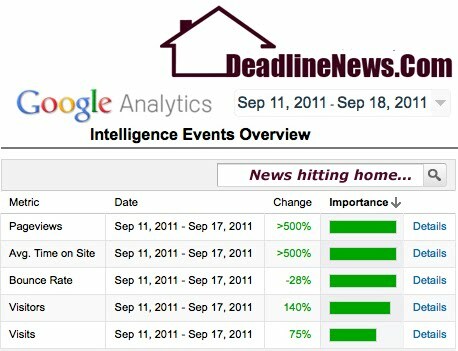 The new DeadlineNews.Com proves it's in demand, has stickiness and is an advertising outlet for your business. Deadline Newsroom - Well no wonder an early advertiser hit the jackpot. Frankly, and we concede, given our crappy old site (Check the Wayback Machine), we had no where to go but up and our page views remain far from where they'll go, but we are hopping happy about this jump in visits to our new and improved web site. We want to thank all our readers who've stuck by us for so many soft years and we especially want to thank businesses who early on have come to our support. But then, a good business knows a bargain when it sees one. Lock in your advertisement space in now. It's only going to cost a lot more later. We expect some serious zoom from our new site. Stay tuned here and on our web site's Buzz page for more updates.